Kolkata, Feb 11 (IANS) Trinamool Congress MP Abhishek Banerjee on Monday blamed the BJP for party MLA Satyajit Biswas' murder and claimed those who are seeking protection from central leaders in Delhi will be brought back and put to justice. Biswas, a Trinamool MLA from Nadia district's Krishnagunj, was shot dead from point-blank range on Saturday night by a group of unidentified assailants. Four people, including Bharatiya Janata Party (BJP) leader Mukul Roy, have been booked by the police on Sunday, and two arrests have been made. A number of Trinamool leaders have termed the murder as a "political killing" and blamed the BJP of eliminating a popular youth leader like Biswas to gain political ground in the district. "Those who are thinking that they would commit crime, abate murders and then go and hide behind the leaders in Delhi, they are mistaken. The offenders will be grabbed by the collar and brought back here," Banerjee told the reporters after meeting the bereaved family members. Refuting BJP's allegations that Biswas was a victim of internal feud within the ruling party, Banerjee, the nephew of Bengal Chief Minister Mamata Banerjee, claimed there is no faction fight within the Trinamool Congress in the area. "Trinamool does not have an opposing faction here. Those who are talking about faction fight let them name the leader of the other faction. There is none. Those arrested or booked in the case are BJP activists. How can they talk about faction fight?" he questioned. "It is BJP's attempt to terrorise people and gain political grounds in the area. But they will not be successful. Losing Biswas is a massive loss for the party but we will not be bogged down. 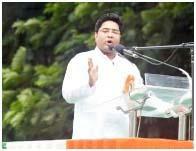 We will create leaders like him in every household in Krishnajung," Banerjee claimed. Citing examples of previous incidents, he also accused the saffron outfit of fomenting trouble in the bordering regions of Bengal like Krishnagunj, which is close to the India-Bangladesh border. Roy, who shifted from Trinamool Congress to BJP last year after his relationship with party supremo soured, has refuted all allegations and claimed that naming him in the FIR is a "political propaganda". Biswas was shot dead on Saturday night when he disembarked from the stage of a cultural programme near a Saraswati Puja marquee in the area. Postmortem report said the cause of the death was a bullet that went though his head.